Daniel Tetteh Osabu-Kle, 65, a former Ghana air force officer, is an associate political science professor at Carleton University in Ottawa. He worked as an airforce engineer, servicing airforce and presidential planes. Under Flight Lieutenant Jerry Rawlings' Provisional National Defence Council (PNDC), a hardline military junta, he had been a director of the Ghana Civil Aviation for two years and Greater Accra Regional Minister for two months. When he fell out with the military regime on matters of principle, he escaped from attempts on his life and came to Canada as a refugee in 1986. “I came here penniless with only US$10 in my pocket. I was alone and have to struggle…My loneliness was informed by the fact that I found the Canadian society individualistic against my Ghanaian communalism. I didn't know anybody here…I led a lonely life for some time before my wife and children joined me,” recalled Osabu-Kle. He took advantage of Canadian opportunities and went to Carleton University for a master's degree in public policy and administration, and later read for a PHD in political science. After his completion of his PHD in 1994, he got work as tenure track professor at Carleton University. Ghanaians have been part of Africans who comprised .3 percent of new Canadian immigrants from 1946 to 1950. Over the next 20 years that figure rose to an average of 1 to 2 percent. A 1966 Canadian government White Paper on Immigration opened the door for impartial screening process for African immigrants. This process saw a reasonable percentage of African immigrants rising to an average of 2 percent from 1968 to 1970, an indication that the new system, despite being selective in relation to Africans, was a bit fair. The biggest influx of Ghanaians to Canada began in the middle to the late 1970s and latter part of 80s. As Mrs. Agyei-Amoama, part of the first generation of Ghanaian-Canadians of the 70s recollects, the influx comprised largely the unskilled and a reasonable number of educated classes who had clashed with Ghana's failing emergent social and political system. “People were finding it very difficult to live, life was very hard, and you could see people lining up along streets for sugar, soap and bread, especially during Gen. Kutu Acheampong's regime. Ghanaians reasoned that there was no future for them in their own country. So they decided to look for greener pastures,” recalled Mrs. Agyei-Amoama. Their migration opened up Canada to more Ghanaians to come to Canada. As a result of the Ghanaian influx, from 1972 to 1973 the African population in Canada rose to 6.8 percent. Apart from the Somalis, the second largest African group in Canada is the Ghanaians. Most Ghanaians immigrants settled in Toronto and Montreal, and a reasonable number in Manitoba. Today, over 60,000 Ghanaians call Canada their home. The influx of Ghanaians to Canada slowed down at the end of the 80s when Ottawa introduced a Green Paper on Immigration in 1976, which effectively restricted entry of potential landed immigrants in the independent class. This was worsened by the fact that potential Ghanaian immigrants have to go to Abidjan, Cote d'Ivoire, where Canadian Citizenship and Immigration offices was located and which served the entire West Africa, to process their documents. Aside from Abidjan, the other two Canadian Citizenship and Immigration offices in Africa at the time were located in Nairobi, Kenya and Pretoria, South Africa. Nevertheless, the 1978 Immigration Act had the positive effect of allowing Canadian citizens to sponsor close relatives. This provisions helped Ghanaian migrations into Canada. It saw increase in the Ghanaian population in the 1990s. Ghanaians call this batch the second generation, including those born in Canada, whose contact with Ghana is not great but have great attachment to Canada. Though Ghanaian immigrants are not coming to Canada as big as in the 80s and 90s, Ghanaians are still immigrating to Canada. Aside from racism, the early Ghanaian immigrant population faced myriad problems. The new Ghanaian immigrants found the dominant Anglo-Saxon Canadian culture incompatible with theirs, especially at a period where misunderstanding was widespread and Canadian multiculturalism was developing. “With the Canadian culture being different, the support system they have in Ghana such as the extended family system was not here in Canada. We faced anguish, racism and ridicule. Some run into problems with discipline. While some form of Ghanaian disciplinary rules are not accepted in Canada, others were. These created problems for Ghanaians in Canada. They had problem rearing their children in a different culture of Canada, yet want to be Ghanaians in Canada where the level of communalism isn't as that in Ghana,” explained Mrs. Agyei-Amoama, whose husband, Charles, currently Ghana's Deputy High Commissioner to Canada, is a well-known Ghanaian-Canadian community development activist for the past 30 years. Most Ghanaians came to Canada with different skills such as the doctors, engineers, mechanics and nurses, and a lot of unskilled workers, assembly line and factory hands. “Even some of those who were skilled find it had to get work in their professional areas because of demand for Canadian experience and so have to work in factories in order to put food on the table and help their people back home,” said Mrs. Agyei-Amoama. As the Ghanaian population expands and they master the Canadian system, they are increasingly learning to negotiate not only racism but other issues they had found difficult at first. Unlike the first generation of Ghanaians, there are now many Ghanaian organizations throughout Canada that not only receive new immigrants but help develop their skills so as to fit into the Canadian society. One such organization is the Toronto-based Opportunities Centre for Ghanaian-Canadians (OCGC), a community based non-profit organization that helps Ghanaian immigrants to settle in Canada. Among its activities are youth programs such as after-school tutorials, employment training and counseling, recreation and sports, basic computer assistance, and art and cultural enrichment. In July 25, 2003 Western Union Financial Services Limited, which has been helping Ghanaian-Canadians transmit money back home, donated four personal computers and one laser jet printer at the cost of $6,604.55 (CAN) to the OCGC. The donation was Western Union's educational support for the centre to advance its community services. Thomas Y. Owusu, a Ghanaian social scientist at William Paterson University in USA, who did a study using information collected in a questionnaire survey of the Ghanaian community in Toronto, reveals that Ghanaians have established a relatively large network of township, ethnic, and national associations. The associations fulfill a wide variety of economic, cultural, social and political functions related to the needs of the immigrants in Canada. Ghanaian-Canadians are part of Ghanaian diasporans who send over US$1.5 billion annually to Ghana. Ghanaian traditional food is found in specific shops. Ghanaian tailors, traditional hair stylists, mechanics, shippers, salons, seamstress who cater for the Ghanaians abound. Traditional outdoorings, funerals and other engagements are marked phenomena in weekends. 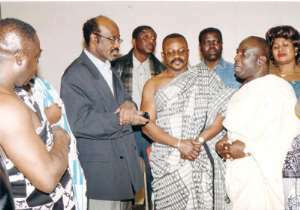 Most of the 56 ethnic groups that make up the Ghana nation-state have their ethnic associations in Canada that serve their needs back home. Owusu reveals that the Ghanaian immigrants use their associations to contribute to community development efforts, sometimes with homeland chiefs coming to Canada to lobby their ethnic groups for development assistance. Still, the associations fight for political rights back home, and maintain ties to their homeland. Owusu's analysis showed that the extent of residence, education and income level, and residential location were the most important determinants of membership in Ghanaian associations. Ghanaian-Canadians have been helping in the development of their communities back home. The Agona Association in Canada (AAC) presented $550 (CAN) to the Our Lady of Grace Hospital at Breman Asikuma in the Central Region of Ghana to settle medical bills of a 19 year-old boy, Isaac Oppong. The AAC saw the boy's story on the internet and raised funds and sent it home for the payment of the bills so that the boy and his parents could be free. Oppong, who was suffering from typhoid perforation, undergone major operation in May, this year, and could not go home because his parents could not afford to pay the medical bills. The boy has been discharged by the doctors since June this year but could not go home because he owes the hospital. Over the years, as the Ghanaian population expands, their rich culture is increasingly coming into the forefront of Canadian multiculturalism, helping to enrich Canada's cultural mosaic. Most Ghanaian ethnic groups stage various cultural festivals throughout the year. Eddie Peprah, treasurer of the United Ghana Association of Ottawa (UGAO), said like most Ghanaian-Canadian associations, the UGAO seeks to unite the Ghanaians in Ottawa and team up with other Ghanaian associations throughout Canada. Ghanaians think their culture could be used as a uniting cord, and that their numerous national and ethnic associations function as family in times of problems and joys. To do this, the associations' stages cultural activities annually such as the one in Ottawa called Ghanafest that bring Ghanaians together and create healthy networking over the years. At a recent Ghanafest at Ottawa's beautiful Vincent Massey Park, Ghanaians showcased their rich culture to Canadians in the form of dance, proverbs and poetry, songs, drumming, fashion and food, drawing a large crowd. Though part of recent immigrants, Ghanaians-Canadians, hardworking, deeply religious and law abiding, have come to see Canada as their second home, and are taking advantage of the opportunities afforded them. Canada now boasts of a sparkling and pulsating Ghanaian population whose members contribute admirably to their old homeland and Canada.